Concrete equipment major Putzmeister is marking its 60th anniversary this year, celebrating six decades of global renown in the production of concrete pumps, mixers and other equipment. Describing the history of the brand, a special statement from the company to mark the occasion said the company’s founder, Karl Schlecht, started the company while he was a mechanical engineering student from his father’s garage and, from the outset, stuck to the principle that contact with the customer did not end upon delivery of the machine, but was also maintained in the period following delivery. Putzmeister’s history proves that hard work and constantly striving to be a leader in innovation are all it takes to grow a small idea into one of the leading manufacturers of concrete pumps, the company said. Closeness to the customers requires a dense and well-structured sales and service network, said the statement, and Putzmeister began establishing its own branches in Germany as early as the 1960s, with sites in Munich, Essen, Hamburg, Frankfurt and later also Berlin and Gera. In the 1970s, the company added subsidiaries and sales offices in other countries – including France, Spain, the UK, the USA, Brazil, South Africa, Singapore, China, Korea, Japan, Russia, India, the UAE, Iraq and Turkey – enabling Putzmeister to act internationally. Furthermore, the company’s sales team is supported both within and outside Germany by well-trained dealers and services centres around the globe. Along the way the company has notched up many ‘firsts’, records and achievements. With the development of a practical mortar pump in 1958, the first continuous mixing pump for gypsum plaster in 1965 and a compressed air-based screed conveyor in 1965, Schlecht revolutionised the industry in both interior and exterior construction work. 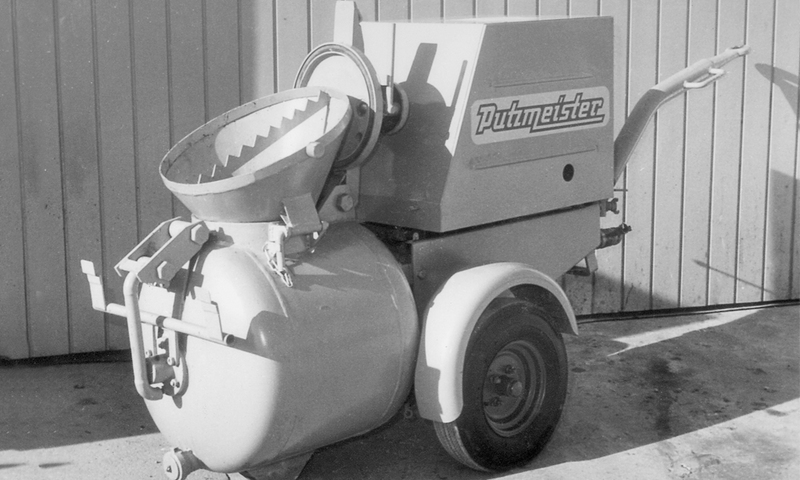 Putzmeister extended its range of products with the development of concrete pumps in the 1960s. Higher pressures, larger pump volumes and even concrete delivery were only possible, in Schlecht’s opinion, if previous design principles were fundamentally questioned and new paths taken. With the concept of a hydro-hydraulically driven two-cylinder piston pump combined with the flapper system (1969), Putzmeister, brought something new to the market despite being a newcomer. Setting a world record of 310m in high-rise concrete pumping at the Frankfurt telecommunications tower in 1977 brought Putzmeister international recognition. This was preceded in 1971 by the invention of a compression-proof transfer tube in conjunction with concrete pumps driven by hydraulic fluid. Among other records Putzmeister has set since then are a then-world record for high-rise concrete pumping (532m) at the Riva del Garda power station in Italy in 1994; a new world record in long-distance pumping with 2015m in Le Refrain/France in 1997; a new world record in high-rise concrete pumping at the Burj Khalifa in Dubai, UAE, with a height of 606m in 2007; the introduction of a new truck-mounted concrete pump with a 70m placing boom reach for the first time ever in 2008; a new Guinness World Record for the largest continuous concrete delivery of 16,200m³ concrete in 18.5 hours at the New Wilshire Grand Center in Los Angeles with 12 Putzmeister truck-mounted concrete pumps in 2014; and a new Guinness World Record for the world’s largest continuous concrete delivery of 19,793m³ in 42 hours during the construction of the Geepas Tower in the UAE. With many of its achievements coming from the Gulf region, Putzmeister is an established and trusted name in the region’s concrete products sector, said Paul Bruns, regional director for Putzmeister Middle East. And the UAE is one of the countries that has recorded some key achievements of the brand. “We are here since in the UAE for more than four decades now. The first stationary pump that was used in the UAE was a Putzmeister; the first truck mounted pump that was used in the UAE was a Putzmeister. Our dealer, German-Gulf, has the state of the art facility in the UAE and we are very well equipped here. In Saudi Arabia we are a long-selling partner now 20 years with our dealer Metco. Also, with state of the art facilities in all major cities, we are further developing our network and footprint in Saudi,” said Bruns. After merging with Sany Heavy Industries Co. Ltd. in 2012, Putzmeister now continues to grow steadily. The company said that over the years it has developed strongly in the concrete, mortar, industrial and substrate technology sectors. Mobile belt conveyor systems and project-based solutions for precasting works complete the Putzmeister portfolio.